Two new species in the genus Auritella (Inocybaceae) are described as new from tropical rainforest in Cameroon. Descriptions, photographs, line drawings, and a worldwide taxonomic key to the described species of Auritella are presented. Phylogenetic analysis of 28S rDNA and rpb2 nucleotide sequence data suggests at least five phylogenetic species that can be ascribed to Auritella occur in the region comprising Cameroon and Gabon and constitute a strongly supported monophyletic subgroup within the genus. Phylogenetic analysis of ITS data supports the conspecificity of numerous collections attributed to the two new species as well as the monophyly of Australian species of Auritella. 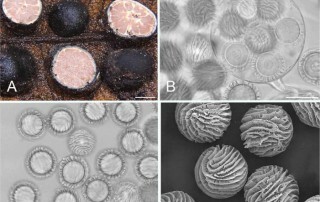 This work raises the known number of described species of Auritella to thirteen worldwide, four of which occur in tropical Africa, one in tropical India, and eight in temperate and tropical regions of Australia. This is the first study to confirm an ectomycorrhizal status of Auritella using molecular data. Kombocles bakaiana gen. sp. nov. is described as new to science. This sequestrate, partially hypogeous fungus was collected around and within the stilt root system of an ectomycorrhizal (ECM) tree of the genus Uapaca (Phyllanthaceae) in a Guineo-Congolian mixed tropical rainforest in Cameroon. 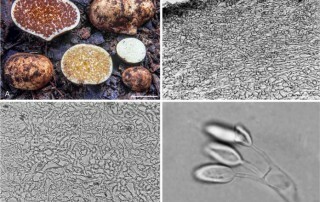 Molecular data place this fungus in Boletaceae (Boletales, Agaricomycetes, Basidiomycota) with no clear relationship to previously described taxa within the family. Macro- and micromorphological characters, habitat, and DNA sequence data are provided. Unique morphological features and a molecular phylogenetic analysis of 304 sequences across the Boletales justify the recognition of the new taxa. Kombocles bakaiana is the fourth sequestrate Boletaceae described from the greater African tropics, and the first to be described from Cameroon. Cantharellus miniatescens is lectotypified. An epitype sequenced for four gene regions (LSU, mitSSU, RPB2 and Tef1-alpha) is selected among recent collections from Cameroon and Central African Republic and fully described and illustrated. Complete ITS sequences have been deposited as barcodes. 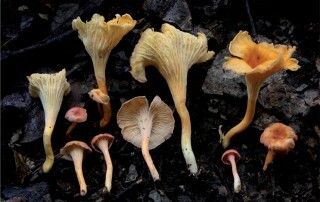 The systematic position is determined using a multigene phylogenetic analysis which places this species in Cantharellus subg. 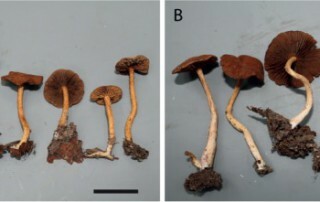 Pseudocantharellus in agreement with its morphological features.